Summers are always hopping on Hilton Head Island, but it is spring that sets the party in motion. Every Thursday evening, from now through May 22, locals and visitors are invited to Shelter Cove Marina to kick off another season of Music and Taste on the Harbour. In addition to an exciting lineup of musical performers, each Thursday two featured Shelter Cove Marina restaurants will offer a menu of light appetizers and drink specials for sale in the shadow of Neptune’s sundial. If coming out for the double-punch of Music and Taste on the Harbour weren’t excuse enough to get your feet and your taste buds dancing, getting acquainted, or reacquainted, with one of the island’s more spectacular treasures, Shelter Cove Harbour, certainly is. Each with a splendid view of the 170-slip, deep-water harbor, the restaurants overlooking Shelter Cove Marina provide a selection of culinary offerings delicious enough to satisfy any craving or whim. 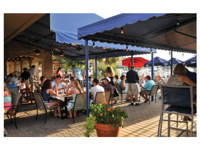 Anchoring the northern-most point of the harbor is Scott’s Fish Market Restaurant and Bar, with Ela’s Blue Water Grille restaurant anchoring the southern-most point. In between, are, Bistro 17, San Miguel’s and the most recent addition, La Fontana’s Waterfront Grill & Pizzeria. With indoor and outdoor dining and a delicious variety of cuisines, Shelter Cove Harbour is a culinary treasure trove. Former visitors from Perrysburg, Ohio, and now fulltime island residents, John and Amber Anderson discovered Music and Taste on the Harbour in its first season and have been fans ever since. “We can’t wait for the next concert. A lot of people bring chairs, but we just love to move our feet and dance. Then we usually go for margaritas and tacos at San Miguel’s. We love Thursdays,” Amber said. In addition to inviting strolling and shopping during Music and Taste on the Harbour, the retailers at Shelter Cove offer year around shopping in the stunning Mediterranean-style village that winds its way along the water. Welcoming new shops this spring, the harbor is adding to the already charming selection of clothing, art, and gifts. From Taffeta’s special occasion and casual wear clothing, to Nash Gallery’s stunning collection of art and gifts, to Camp Hilton Head’s vacation clothing and accessories, there’s something to entice everyone, with more to come! 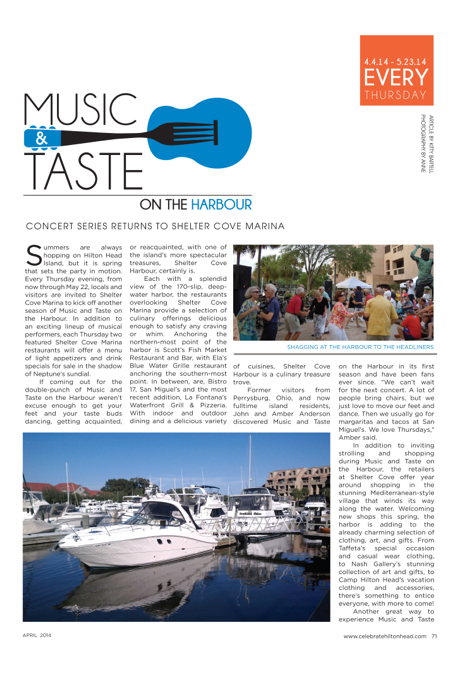 Another great way to experience Music and Taste on the Harbour is to arrive by boat. New harbormaster Kyle MacDaniel is ready to tuck you into a slip and set your evening in motion. (In addition to overseeing the daily operations at the harbor, MacDaniel and his crew offer an exciting array of on-the-water activities, including deep-sea and inshore fishing charters, sailboat and powerboat rentals, sightseeing and nature excursion charters, dinner cruises, and canoe and kayak rentals. With the specter of winter behind us, Music and Taste on the Harbour is beckoning us to come out, shake off the chill, and get this party started. 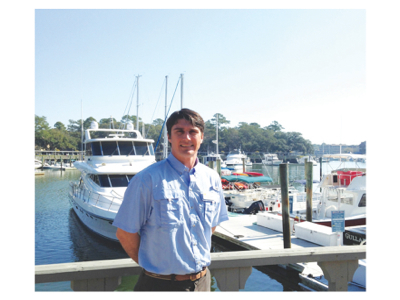 Arriving in early February in the midst of Hilton Head’s wet, cold, winter, Shelter Cove Harbour’s new harbormaster, Kyle MacDaniel understands that his harbor will soon be at the epicenter of much of the island’s water activity. Originally from Maryland, MacDaniel spent many summers visiting his mother on Hilton Head Island, and says this is where he was first introduced to boats and fishing. So how does one become a harbormaster? “I started out working on the water very young; worked my way up from mate on a boat, then into a captain’s position on a small boat. Then I moved to South Florida where I ran dive charters and worked as a dive instructor. I began working on larger private yachts, and after traveling for a lot of years living on boats, it was time to go land-based. I got married, and it was a steady progression from working on a boat all day, every day, to going land-based and still wanting to be very much involved with the industry. Being a harbormaster became a very good option. It keeps me in tune with the industry and all of my passions that have kept me boating all these years,” MacDaniel said.